Toronto-born artist and teacher Yvonne McKague Housser is perhaps most well-known for her paintings of Northern Ontario, particularly such mining towns as Cobalt. For these works, Housser took a vibrant and boldly outlined style that suggests early Lawren Harris paintings of Toronto neighbourhoods. 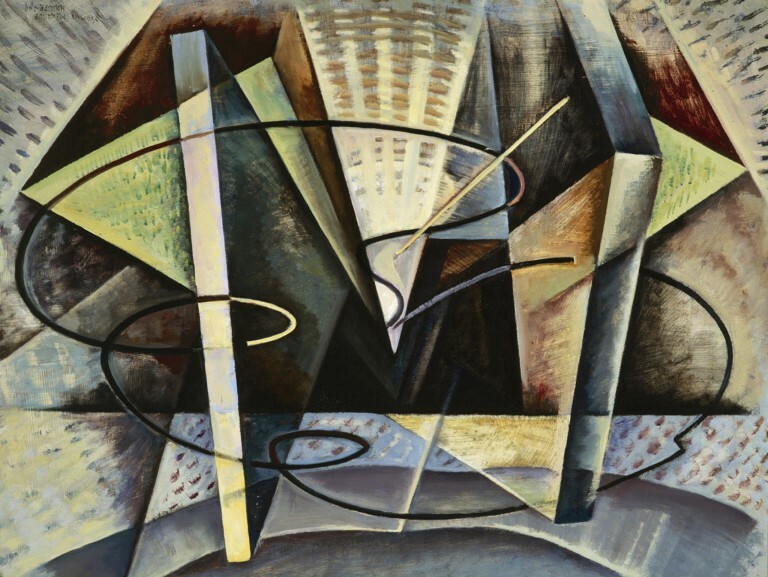 Yet she also forayed into abstraction, choosing a path that Canadian artists had begun to explore in the 1920s. Abstraction No. 1, created the year Housser retired from teaching at the Ontario College of Art in Toronto, shows Housser’s ability to create dynamic compositions from geometric form and an uncharacteristically subdued palette. Eager to learn more, Housser would travel to Cape Cod to study Abstract Expressionism with German-born American artist Hans Hofmann in the 1950s. Housser had completed her early formal training at the Ontario College of Art (1915-20) and three academies in Paris (Académie de la Grande Chaumière, the Académie Colarossi and the Académie Ransom) before returning to Toronto to teach at OCA in 1922. She later taught at Kitchener’s Doon School of Fine Arts and at Toronto’s Ryerson Polytechnical Institute (now RyersonUniversity). She was also active in the Canadian arts scene, becoming a member of the Ontario Society of Artists and the Royal Academy of Art as well as showing in three Group of Seven exhibitions (1928–31). A founding member of the Canadian Group of Painters in 1933, Housser supported the growth of Canadian art in any way she could. Her foray into abstraction was a natural extension of her constant striving to find new modes of expression and, in doing so, to push the limits of what Canadian art could be—and become.